Starting at the Lake Sebago boat launch, the blue blazed Seven Hills trails begins as soon as you cross Seven Lakes Drive. Like many of the hikes in this area, as soon as you enter the woods you begin a punishing climb. This one happens to go on for approximately half of a mile. The pictures below show the steepness going up and down the trail. On the left is the climb up. Since this is a loop hike, the picture on the right is the hike down. The trail continues moving downhill until you begin another ascent where the Seven Hills Trail veers sharply off to the right and for a brief time becomes Woodtown Road West. After about a quarter of a mile, you make a sharp left turn and begin walking on Pine Meadow Road West. The point on the Seven Hills Trail where it becomes Woodtown Road West. Although this sign is pretty big and prominently placed where it can’t be missed, people still drop water bottles, trash and yes, even diapers on the trail and the side of the trail. Stay on this road until you intersect with the end of the yellow blazed Buck Trail and then make a right turn onto Pine Meadow Road East. 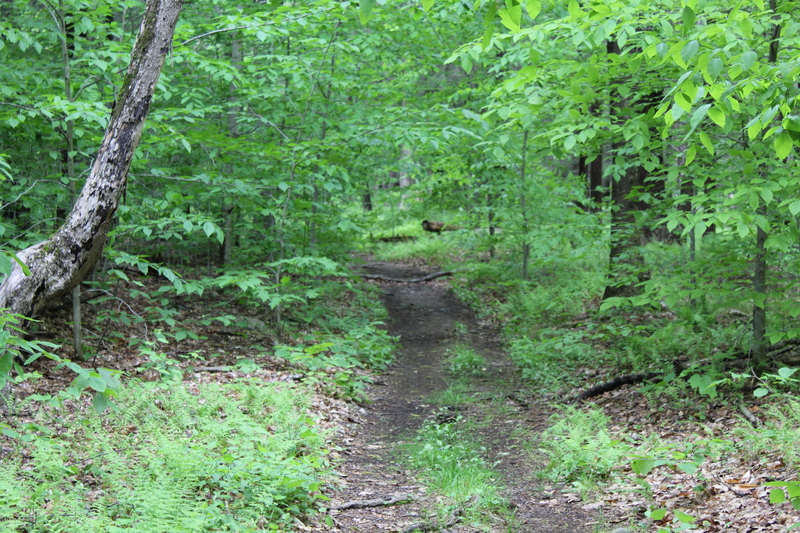 Although the Harriman-Bear Mountain Southern Trail Map 118 is pretty detailed about where you need to go, these roads are unmarked and some trails and other roads veer off to the left and right all along your route. At one point I did make a wrong turn but with good results. I stumbled upon these ruins and I took a short break to rest and take some pictures. After doubling back to the correct trail, I eventually got to the shores of Lake Wanoksink where because of the weather, the views weren’t that great. It’s still an interesting picture! Once you head around the lake, take some time to walk across the earthen dam where if you look to your left, you see this bridge that you will soon cross over. This entry was posted in Uncategorized and tagged Circuit Hikes in Harriman, Harriman Hikes, Harriman State Park, Hiking, Hudson Valley Hikes, Inner Peace, John Muir, Lake Wanoksink, peace, Photography, pine meadow road east, Seven Hills Trail, walking as meditation, wilderness photography, Woodtown Road west on July 26, 2017 by The Zen Hiker.